Sepulchral Productions waited until the right moment to release Forteresse Par Hauts Bois et Vastes Plaines. If there ever was an album I could call “wintery”, this one would be it. (There is the first snowstorm of this season blowing outside as I write this). While some bands only manage to make an intro out of the wandering pompous iciness, Quebecois Forteresse pulled off a whole album worth, but since Par Hauts Bois et Vastes Plaines was probably meant to be heard as a whole the Canadians did not bother to name individual parts and simply provided numbers for their ambient blackened slow melodic movements. The location is somewhere in the frozen tundra of Quebec boreal forests, and the music is oppressive harsh cold doomy atmospheric wall of sound constantly coming at the listener. 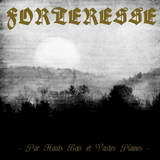 Not big in the sound complexity department, Forteresse provided a very suitable soundtrack to ponder thy failures or admire nature’s grandiosity, alternatively, doing both at the same time. With their careful placement of melodies and synthetic short interludes Par Hauts Bois et Vastes Plaines takes on a feeling of a journey through some unforgiving surroundings, even if its closing part (VII) is slightly less convincing. As much as ambiance is key to this album, its main parts (I, III and V specifically) are quite blackish. When emotions or voyage hardship bubble over the top, the band pipes in double bass explosions (I) or more pronounced guitars layered atop constantly beating exalted drums. These rolling pieces of music come of as shamanic with incantations and mysterious dances taking place in a blizzard (III) with the voice appropriately losing itself in this textural snowy fog. In spots Par Hauts Bois et Vastes Plaines reminded me of the early Kampfar, and borrowed a passage or two from Scandinavia, but overall Forteresse certainly has its own personal identity about them. The album, which is not meant to instantly sweep you off your feet, Par Hauts Bois et Vastes Plaines, its murky production and all, will prove that there is French Noir metal feeling outside of France, and the Canadian province of Quebec is a perfect place to experience it, even if the details get tedious at times.